The decision may result in relocating detainees further away from legal aid and loved ones while the mass incarceration of undocumented people continues. Kara Hernandez and her son, Victor Hernandez, Jr.
Contra Costa Sheriff David Livingston's recent announcement to terminate his department's contract with Immigration and Customs Enforcement to hold hundreds of immigrant detainees in the West County Detention Facility in Richmond was hailed as a victory for immigrant's rights by the region's political leaders, who cut the deal behind closed doors. But for those who have been held in the jail on immigration charges, and their family members, the impending closure could do more harm than good. Family members of ICE detainees say that simply closing the facility doesn't solve what they characterize as the underlying problem of mass incarceration of undocumented people. Another problem is that ICE detainees at the Richmond jail will likely be kept in detention and removed out of state, making it more difficult for their families to support them. It could place people farther away from legal resources, and detainees could ultimately end up under the jurisdiction of different immigration courts where requests for asylum and other reliefs against deportation are denied at higher rates. "The most surprising thing was that there was no real input from the people most impacted," said Liz Martinez of Freedom for Immigrants, a group that advocates for the abolition of immigrant detention, about the decision to end ICE's contract in Contra Costa. "What's really at stake is the transfer of people away from their families and from legal representation." "You would think it's an awesome victory, and I would have thought that, too, until I experienced this," said Kara Hernandez. 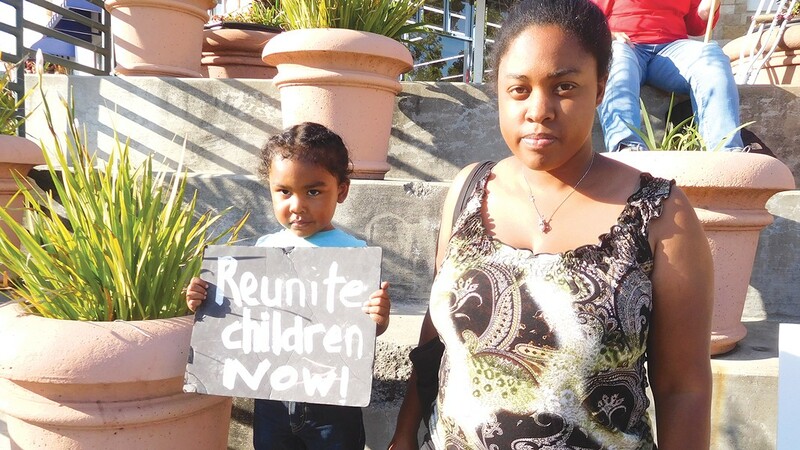 Hernandez, a mother of three who lives in El Cerrito, is directly impacted by the Contra Costa sheriff's decision to terminate the department's ICE contract. Her husband, Victor, was held at the West County Detention Facility since May 13 on charges that he illegally entered the United States. His arrest and detention by ICE has been an incredible hardship for their family, said Hernandez, but she was able to take her children to visit him twice weekly. The Richmond jail is only 20 minutes away from her home by car. But recently, Victor was transferred to a private immigration detention center in Colorado run by the Geo Group. "I wish there were other options," she said about ICE's detention of immigrants. "He should be able to be home and take care of his family, but they're tearing families apart." Hernandez said ICE explained the transfer to her husband as being necessary to make room in the Richmond jail for another group of detainees who were being transferred from Sacramento. Sacramento County also recently terminated its contract with ICE to hold detainees in the county jail. But now that Contra Costa is moving in the same direction, there will be even fewer places to hold detainees in Northern California. ICE told the Express that detainees from Sacramento's jail have already been sent to Colorado and as far away as Hawaii. In an email, the agency stated that, "instead of being housed close to family members or local attorneys, ICE may have to depend on its national system of detention bed space to place those detainees in locations farther away, reducing the opportunities for in-person family visitation and attorney coordination." Hernandez said her husband's condition has deteriorated since he was moved. "He's lonely and depressed, because he doesn't get visits anymore," she said. "I knew that, but to hear him say it, it's just terrible." On average, about 38,000 people were jailed per day by ICE in 2017, with 960 of those detainees held at the West County Detention Facility. While other sheriff's departments have recently terminated their contracts with ICE — part of a broader shift in public opinion against Trump's xenophobic policies — federal immigration authorities show no sign of moving away from the longstanding policy of mass incarceration, a policy that was in effect under previous presidents, including Barack Obama. In fact, the Trump administration is ramping up detention. Trump requested $2.8 billion for ICE's detention budget next year, which would create 52,000 "beds" in jails and private prisons. The result is that while states like California attempt to close publicly owned and contracted detention centers — mainly county jails run by sheriffs — ICE will increasingly rely on private prison companies with facilities in more conservative states. The Hernandez family's problems illustrate the complexities of closing ICE detention centers in some regions without addressing the broader problem of mass incarceration. Their case also reveals how Contra Costa's sheriff has worked closely with federal immigration agents to locate and arrest undocumented people — a practice that could continue, even as the sheriff closes out the jail contract. Victor Hernandez was born in Mexico, but he was brought to the United States when he was 6 months old. He grew up in San Jose, and most of his family is in the United States. "He doesn't know anything about Mexico," Kara Hernandez said. But in 2011, three years before Kara and Victor met, and six years before they got married, Victor was driving in San Mateo County with several bags of cannabis in his possession. He was stopped by a police officer, arrested, and charged with possession with intent to sell — a felony crime that automatically triggers an effort by ICE to deport someone if they're undocumented. Because he didn't have an attorney who understood the immigration consequences of the charge, Victor pled guilty in hopes of receiving a more lenient sentence. Last year, California voters legalized cannabis, but federal law enforcement like ICE still treat the plant as a drug that's no different than cocaine or heroin. Because Victor pled guilty, ICE was able to quickly locate him and initiate proceedings to deport him. Victor fought the case, but he had a difficult time finding and paying for an attorney. Many of the nonprofit legal aid groups he contacted turned him down because Victor wasn't detained at the time. Most immigration nonprofits focus their resources on helping detained immigrants fight their cases. In 2014, Kara met Victor. The two got married last year, and they had a child together, Victor, Jr. Kara also has two children from a previous marriage, but she said Victor has in all respects become their father. They hoped that they would be able to obtain legal status for Victor, and last March Kara set up a GoFundMe page to raise money to pay for an immigration attorney. But then earlier this year, Kara and Victor got in an argument. They had been drinking, and Kara said that she called the police on her husband. She says now that it was a mistake, and that the incident hadn't actually involved domestic violence, but that she was triggered by trauma she experienced from a previous abusive relationship. Nevertheless, the El Cerrito police arrested Victor and placed him in the Contra Costa Sheriff's Martinez Jail. "His mother bailed him out," Kara said, "and he could have walked out of the jail, but the sheriff's deputies asked him to stay for just a few more minutes to fill out some paperwork." Kara and Victor think that the request was a ruse because a few minutes later, several ICE agents appeared and arrested Victor. It's unclear how the ICE agents knew of Victor's release, but the Contra Costa Sheriff's Department has an extensive history of working with ICE. Recently, the sheriff began publicly posting inmates' release dates in order to circumvent the state's sanctuary law, SB 54, which prohibits local law enforcement officers from helping immigration agents arrest undocumented people held in jails. And prior to the implementation of SB 54, the Contra Costa sheriff's deputies repeatedly helped set up arrests of undocumented people with ICE agents. In some cases, sheriff's staff would call in undocumented people who were participating in the sheriff's custody alternative program, which is similar to probation, so that ICE agents could conduct a surprise arrest (see "Ambushed: Contra Costa County Law Enforcement Sets Up Surprise Stings To Help Federal Immigration Agents Arrest and Deport Immigrants," 1-10-2017). ICE transferred Victor from Richmond to Aurora, Co., on June 21. Kara said the relocation came as a surprise. "His mother called me," she said. "We were scared. They took him to San Francisco, and then put him on a plane, but even on the plane, he didn't know where he was going. He thought the worst." Since being moved to Colorado, Kara and Victor now communicate only by phone. Calls cost 9 cents a minute, according to Talton Communications, the private company that handles ICE's phone system. Kara said she can't afford to make trips to visit him in person, especially with three young children. She worries about how her children will be impacted by the absence of their father. But she also recently learned that her husband is eligible for release on a $15,000 bond and is trying to raise money to pay for it. These days, in place of visiting Victor, Kara participates in a weekly protest in front of the El Cerrito shopping plaza. Last Thursday, she stood in a line of protesters waiving signs calling for the end of immigrant detention.